Kids who learn about good nutrition during childhood are much more likely to have healthy eating habits. 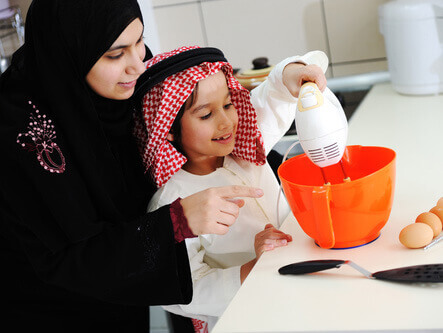 Have your child help in the kitchen by stirring batter and adding spices. Discourage snacking on sweets and fatty foods. Encourage your kids to enjoy fruits and veggies by exposing them to a wide variety from an early age. It's true — parents are powerful role models. Minimize distractions and turn off the television during meals. Don't assume your kids won’t like a certain food. Keep offering a variety! You might be surprised by what your child will try. Make sure your child has a chance to see older siblings, cousins, or friends eating a variety of foods. Kids often will follow their lead. Tell your kids that eating certain fruits and veggies will help them be like their favorite characters. Kids love modeling what they see in movies or books. Your child might be more interested in eating with a spoon or fork, especially if an older sibling is using utensils, too. Show your kids that you like a wide variety of healthy foods and give them many different options to try. Let them watch you enjoy the food first. Then have them try it so they feel like it’s more their choice to eat it. Kids may need to try a new food many times before accepting it. Offer small portions combined with their favorite foods. Don’t force it. Don't get hung up on it. Don’t give skim or 1% milk to children younger than 2 unless your doctor prescribes it. Kids should continue to drink whole milk until age 2. After 2, kids can be switched to low fat milk (1% milk or skim milk).